In most of the remote Himalayan villages where The Small World works, it is painfully obvious that health care access is very limited to the extent that people are forced to live with diseases that are never diagnosed. In fact, people have to walk for several days to receive just basic medical assistance. Thus, we have been eye witnesses to the fact that the majority of the populations where The Small World works are in desperate need of health care due to complex geography and impoverished economic conditions. The Small World's mission is to always consult local community members and discuss with them how we can help as well as determine together the most important improvement that can benefit their lives. When we received a request from local community members to create a medical camp for their needs, we used the existing health post and helped set up awareness education and a fully equipped birthing center with trained local women as skilled birthing attendants for the safety and health of mothers and new born babies. The maternal mortality and the neonatal mortality are very high due to the practice of home delivery without any medical assistance. With the availability of the SBA and birthing center, we at The Small World are dedicated to helping reduce those mortality rates. With a further request from local community members, we also organized a free three day medical camp in October 2017 with an American team of medical volunteers, including eye doctors, pediatricians, dermatologists, dentists, general physicians, pharmacists, and non-medical volunteers. This effort is typical of our mission, as The Small World’s work is largely based on the spirit of local community and volunteers and bringing people together who want to make a difference. In three days, we saw 1,140 patients; some had walked for days or many hours to see doctors, and for many it was their very first time to see a specialist. There were many acute and a few chronic health problems during this camp. It was a very rewarding experience for all our volunteers who travelled from the United States with Incarnation Nepal Team. We would like to offer our profound thanks to Incarnation and to all the local communities for their deepest support, for so warmly welcoming us into their community, and for helping to organize the support they needed. We were highly requested by local community members for the continue service into their community.We will try our best to bring free health care to the people of this region for their better health and a stronger community. 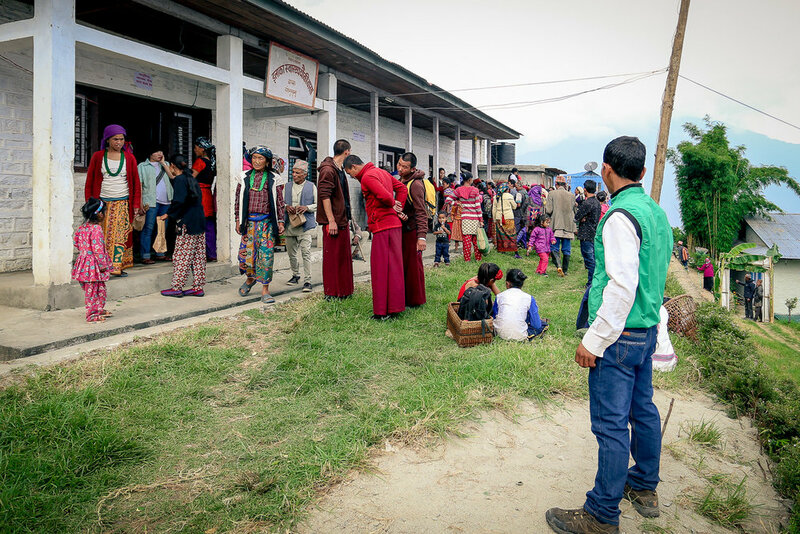 We were also very happy that even more benefit to the community took place during this health camp, because while we were so engaged with the local members, we took the opportunity to educate them and their children and worked shoulder to shoulder with them to help build a school that was damaged from the 2015 Nepal earthquake. We are also very excited to continue this medical camp in fall 2018 with same group of our partner from Church of the Incarnation.